The conference will open with a keynote address by Dr.Sarah L.Eddy, entitled “End of Lecture? Active learning increases student achievement“. Dr. Sarah L. Eddy is an Assistant Professor in the Department of Biology and the STEM Transformation Institute at Florida International University. Trained as a behavioral ecologist, Sarah has shifted from studying behavior in the field to behavior in college classrooms. Her research focuses on understanding how college instructors can contribute to the goal of equal participation of historically underrepresented groups in science careers, specifically documenting current disparities in student classroom experiences and working with instructors to deploy interventions to address these. 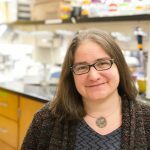 In addition to scholarly publications, Sarah’s work has been featured in the New York Times, The Atlantic, Science, and Insight into Diversity.